The Government Law College, founded in 1855, is the oldest law school in Asia dating even prior to the University of Mumbai, and enjoys a pre-eminent national and international reputation for excellence. GLC which has a rich heritage and pedigree, is the repository of erudition in the legal firmament and has had the privilege of guidance from eminent legal luminaries such as Dr. B.R.Ambedkar, Lokmanya Tilak, Justice M.C.Chagla, Nani Palkhivala and several others who have adorned benches of the Supreme Court of India and the Bombay High Court. Equally, students who have passed from the portals of GLC have distinguished themselves at the Bar, the Judiciary and the Academy. In the 3-day conference, delegates will be assigned to be diplomats, and utilize their full potential to seek for the best offer for the nation they represent. GLCMUN provides the best platform for delegates to exchange inspirational ideas and cooperate with one another in preparing a drafted resolution. Simple as it may seem, people with Model United Nations experience can certify that it is more than debating and composing a new document. MUN – in addition to helping you improve your eloquence, negotiating and writing skills – also nurtures our sense of global awareness, encourages collaboration and connects people with the same vision. The value of a MUN conference may differ from one person to another, however, we are confident that all participants will find the experience thought-provoking and insightful. Apart from the 3 day conference, the event will witness two social nights at the well- known South Mumbai clubs. We, the organizing committee, will definitely strive for our best in bringing a unique MUN experience to all the participants and we look forward to seeing you and realizing a collective achievement together. All the relevant information regarding the conference has been uploaded on the website. 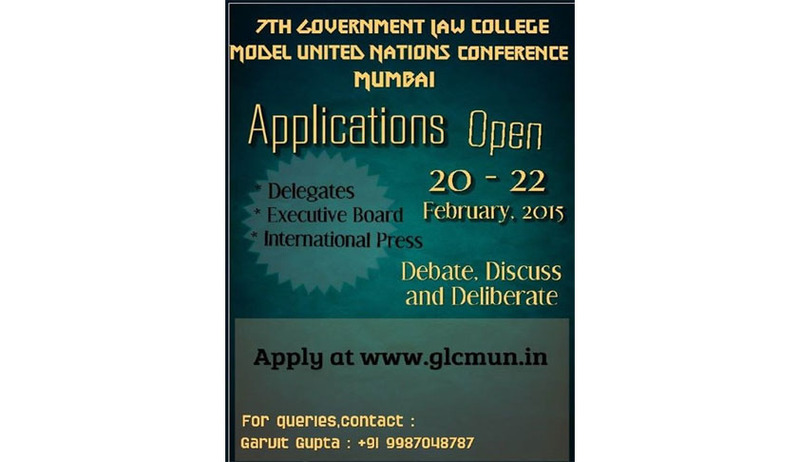 Accommodation will be provided to the participants GLCMUN 2015 by the Secretariat on a strictly first come first serve basis. Those who wish to avail of this facility can apply for the same by selecting the relevant tab in the delegate form and then making payment through the online portal.